PHUKET: A visa run van from Phuket with hit a roadside sign and was brought to a halt on the verge of a highway in Phatthalung, Southern Thailand, in the early hours of this morning (Feb 7) after the driver drifted off to sleep behind the wheel. 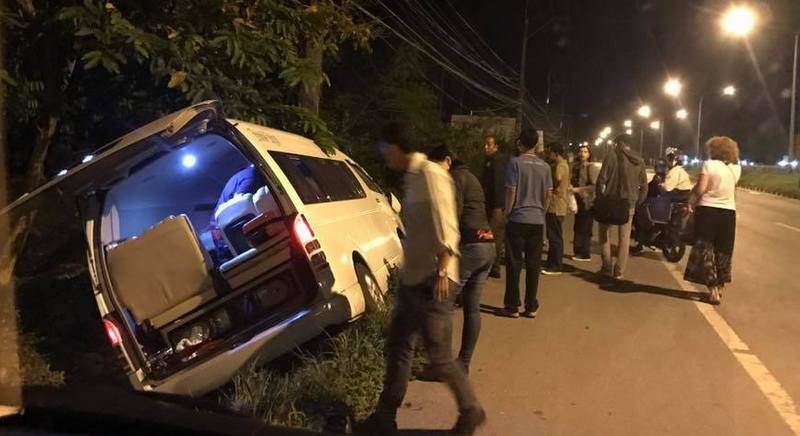 The minivan, operated by Phen Phet Visa Run in Chalong, in the south of Phuket, was carrying foreigners on a visa run to Penang, Malaysia, when the accident happened. Capt Manop Suwanmanee of Srinakarin Police Station in Phatthalung Province confirmed the accident occurred at about 3:40am. “The driver, Theerapong Thanrot, said he drifted off to sleep while driving. The van hit a sign for Srinakarin Hospital before he brought the van to a stop on the grass beside the road,” Capt Manop told The Phuket News. “There were no injuries in the accident and Mr Theerapong was fined B500 for reckless driving,” Capt Manop said. With the van stuck beside the road, Mr Theerapong called another van to pick up his passengers so they could continue their journey, he added. Benjamaporn Phansa, Manager at Phen Phet Visa Run in Chalong, Phuket, confirmed to The Phuket News that her office was aware of the accident. “Thankfully, everything is okay right now and the passengers have continued their visa run to Penang,” she said. What an absolutely shocking, disgraceful, disgusting state of affairs. How can this organised, syndicated corruption between the transport authorities and the Thai police be allowed and tolerated? The whole country needs a root and branch overhaul to eliminate this syndicated corruption. And what sort of a "penalty" is 500 Thai baht? Absolutely meaningless. Because there's no real penalties to make Thai drivers responsible for accidents which cause death to Foreigners. Make no mistake, there's around 90 deaths every day in Thailand. Foreign nations should on forehand warn their nationals that Thailand is a dangerous country when it comes to Bus-, taxi-, minivan-, tuk tuk drivers. Taxis have 'fixed' meters, or refuse to use meter. Put face towel over it. Minivan drivers fall often asleep while driving. That will be a enormous punishment, and warning for visa run minivan drivers. Point is: The drivers never learn, soon the same accident again. The idiot unneeded Thai visa runs,....the tombola of your life. What Penang thai consulate is doing , that same thing the Phuket Immigration can do here.